Neutra™ Fuel Stabilizer is a highly concentrated, multi-functional, ashless fuel stabilizer formulated for use in all grades of gasoline including ethanol-blended gasoline, all types of diesel fuel and biodiesel blends. 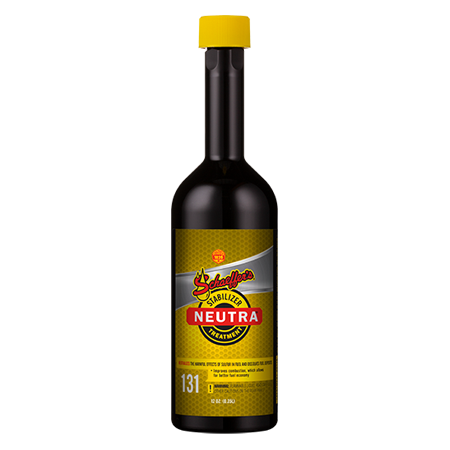 Blended with an enhanced detergency package, Neutra™ provides impressive cleanliness to fuel lines, tanks, pumps, injectors and carburetors. Neutra™ disperses existing deposits throughout the fuel system, safely removing them to the combustion chamber where they can be burned cleanly and completely. Additionally, Neutra™ can be used as a flushing fluid to purge and remove varnish and carbon deposits present in equipment. Neutra™ is suitable and meets the US EPA requirements for blending into low sulfur diesel fuels. Contains more than 15PPM sulfur. Lowers the freeze point of any water that may be present in the fuel. Keeps injectors free from varnish, deposits and gum that cause inefficient operation. Strong wear protection for injectors, fuel pumps, compressor ring, upper cylinder, valve seats and guides.